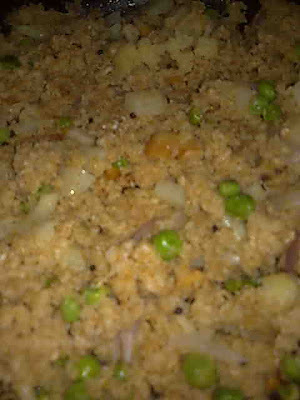 Vegetable oats upma is one of the healthiest dishes so we eat it on a regular basis keeping in mind its health benefits. Also it is very quick and easy to make, packed with goodness. Vegetable oats upma is an almost instant food without compromising on health. 1. Take a non- stick pan and dry roast the oats till they leave their whitishness and turn brown. Take them out of the pan. 2. Heat oil in the same pan after wiping off with a dry cloth. Add mustard seeds. When they splutter, add chana dal and roast for 1/2 a minute. Add urad dal, peanuts and cashew nuts. Roast till they become light brown. 3. Add onion, green chillies, ginger and curry leaves. Sauté for a minute. 4. Add vegetables, water and salt. Cook covered till vegetables are tender. 5. Add oats and mix well. Lower heat and cook for about 3-4 minutes, covered. Turn off heat and let it stand for 3-4 minutes. Healthy Bytes- oatmeal is a rich source of dietary fiber, both soluble and insoluble. Oats are proven to be effective in lowering blood cholesterol. Whole oats also reduce high blood pressure. Fiber in oats helps in regular bowel movement. Oatmeal also helps with weight loss.